US State Flags is an Encapsulated Postscript (EPS) collection of 50 full-color US State flags representing states throughout the US. US State Flags also contains additional flags, including 35 Current and Historical USA flags, and 7 District and Territory Flags. Each flag is full color and drawn to the highest detail to insure superior reproduction quality at large or small sizes. 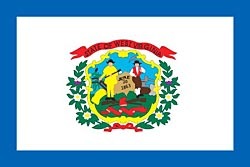 To enable the designer to verify the level of quality of the flag artwork, you can check the level of detail on an example such as the complex West Virginia flag opened in Adobe Illustrator. Macintosh and Windows files are provided in EPS format. US State Flags - ©2014 Digital Wisdom, Inc.